Hammer toe, claw toe, mallet toe and retracted toe all refer to toes that don’t sit flat on the ground when you are standing, but rather get an angular bend in the joints, making one of the joints prominent above the usual thickness of the toes. This higher joint is then prone to trauma from a shoe, as most shoes are only made for normal feet. The tip of the toe is also worse off as it bears weight on the point rather than the cushioned pad underneath. This often results in a hard patch on the end of the toe (a corn) and a deformed toenail (diagram1). 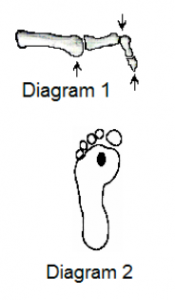 Also, the knuckle behind that toe in the ball of the foot (diagram 2) will usually develop a bruised feeling. Small fluid filled bumps called bursae may appear on the toes, particularly in younger women. toe muscles on the top of the foot helping to do its job. Shoes shorter than your toes, making them bunch up. thicken up and hold on to the shoe better. Strokes or any disorder causing weakness in muscles. A bunion encroaching into the space of the 2nd toe. Arthritis affecting the body as a whole. Obviously, no matter what the cause of clawed toes, shoe fit is important for comfort. Shoes that cover only the toes and leave the instep bare are the worst style as the shoe has nowhere to hang onto except the toes. A shoe that fits well around the instep will stop the foot from sliding into the end of the shoe when you are walking downhill or downstairs and makes it possible for the shoe to stay on easily without relying on being tight around the toes. directly. For example, a pad made to help a weak shin muscle to do its job will stop the long toe muscles having to contribute in a way that causes bunching up of the toes. they have low resistance to infection. Protective devices are available and have variable success depending on the cause of the problem. More can be done to help a toe that is still able to be straightened out rather than one that is locked into a clawed position so don’t delay in seeking help.